Arts in Motion hosted more than one hundred art patrons and philanthropists Saturday, August 15th for the Chair Affair fundraiser. Arts in Motion is an organization that provides art, music, and dance opportunities for persons physically, emotionally, or mentally challenged. The Richard App Gallery served as fascinating backdrop to the auction on a hot evening, which actually felt like a night in Morocco. The App Gallery opened the doors wide and set the ceiling fans turning; the mix of heat and cooling were enchanting. A tent village in the sculpture garden allowed patrons to step out of the action and drink a bit of wine seated at the comfortable wrought iron tables. Wine was poured by an affable staffer in an Art of the Table apron, serving a simple white or red vintage. Brothers Robert and Richard App are constantly finding new uses for the space, from drop in yoga to community mixers, and the buzz about possible new quarters for the vibrant art business astounded more than a few. Grove, Brewery Vivant, and the Green Well– all those business coalesced around the seed planted by the Richard App Gallery. In a stroke of location luck, the easterly sculpture garden connects to the luxuriant gardens of the Inner City Christian Federation building, tended to a late summer crescendo by master gardeners educated at Michigan State University. It was a good investment of a precious summer evening. Ted Jauw is a most singular man. Shamanic to the nth degree, he walks with ecstatic welcome in the communities of North America and Africa. In fact, his recent wedding, after which he battled a life-threatening illness, was open to all people who wanted to wish his wife, Kate, and him well. I was enchanted by him when he enthralled a small audience gathered at Unity of Muskegon a few years back. Jauw had several years almost as accursed as the Biblical Job, losing employment, home and family. Given the advice by an Lakota elder, “Have you gone to cry in the wilderness”, Jauw sat beside his truck for several days in the cold of the Badlands with little more than tobacco to smoke. All was restored to him and more in Grand Rapids. His gifts as an almost hypnotic storyteller aside, I wondered if he might have been the best pick as auctioneer. 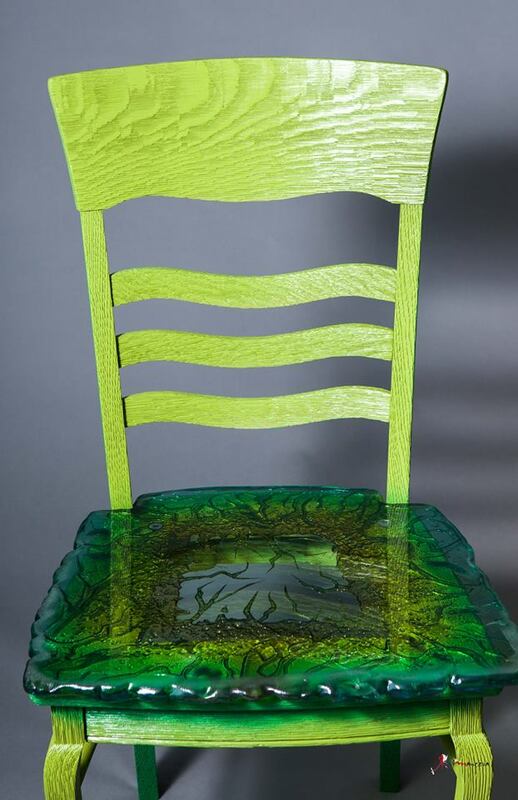 Roli Mancera brought a chair that fused old oak with etched glass, and it earned a top bid. Jauw wisely started bidding at two hundred dollars and coaxed a lull in the bidding into a second wind. Jauw knew the goods on Mancera, the shaman understanding the young Latino elder. Mancera has won notice as a sculptor and artist of regional stature. A builder of ofrendas during the passionate months of October and November, Mancera has added performance art to his practice. Jauw shared with his patrons how he witnessed Mancera’s ritualistic self-cutting of his jet black hair, recreating the moment for us that evening. “Cabello es arte”, Mancera might say. “Tierra es arte”, Mancera has taught his son. One wonders if a professional auctioneer might have sold the masterful chair for a thousand. In one of several cases, Jauw didn’t investigate his artists, selling a chair prepared by an award winning actress, playwright and director without a moment of biography. To say this is to be unfair to Jauw because he carried his duties far better than average in art auction memory. I recall donating an oil painting of the Oak Island Light painted by a famous General Motors automotive illustrator and providing a backgrounder. The volunteer auctioneer looked at it, put a starting bid on it of forty bucks and let it go for forty bucks. The backgrounder stayed in the background. I had drinks with the cherry picker one night, an art collector with a fortune from a law practice and a medical practice. He regaled me with stories of how he gave it pride of place in the den of his Arizona hunting cabin. 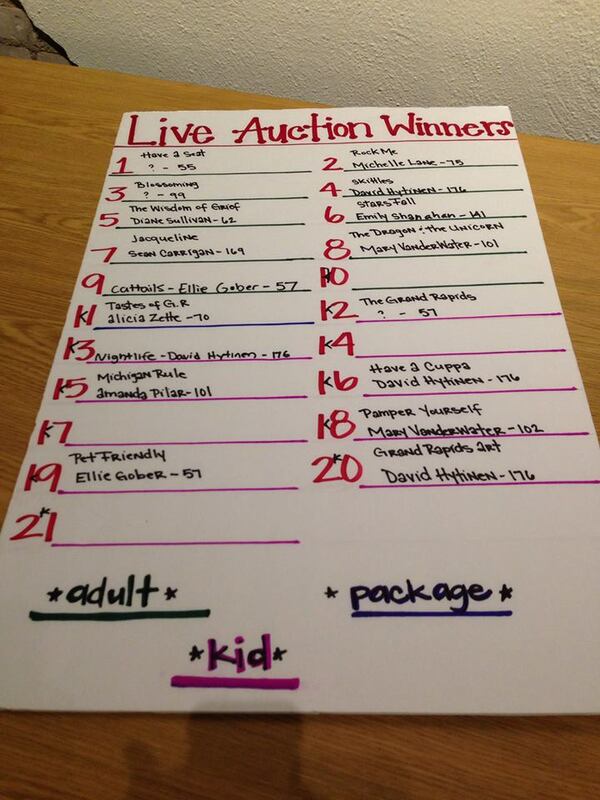 Something about the West Michigan practice of charitable art auctions needs to change. Speaking about men with shamanic powers, maybe we should tap into the wisdom of Tommy Allen, whose Art Battle for Community in Creston, held at the Rezervoir Lounge, always has bid battles rocketing towards the thousand dollar mark. what is the ratio of critics to artists in this town? There has been some concern about the dearth of coverage for local art or cultural events. In my opinion this post was informed and offered some constructive suggestions. We would welcome a written rebuttal that could be posted on the site. I’m disappointed that Mr. Juntunen took so much time to highlight the already-established institutions and names in his article and critique our auction process by stating that “Jauw didn’t investigate his artists, selling a chair prepared by an award winning actress, playwright and director without a moment of biography”. I wish he had followed his own advice and investigated Arts in Motion Studio, the organization the entire event was designed to benefit (at the very least he could have investigated his terminology when referring to them)… He gives more information about the history of the venue then he does of our work or our student artists (several of whom were there that evening and would have enjoyed speaking to him). One of the points of Chair Affair is to have another opportunity where our students are held at the same level of professionalism and respect as other working artists- not reguarding any one creative voice as more important than any other- an idea that unfortunately got completely missed in this piece. It’s too bad that Mr. Juntunen didn’t take the opportunity to shift his perspective and learn more about the event and organization. Mr Juntunen has three Arts in Motion magnets on his fridge door and has informed himself of the mission and program of AIM. Art-Hack concerns itself with art criticism, which usually means holding phenomena up to standards. By the standards set by Art Battle for Community, Chair Affair could have done more for the artists career and sales records. He has attended two Chair Affairs, 2014 & 2015, each time at the invitation of a chair artist, Kit Kat Harrigan and Sue Bradford, the actress & playwright. On the two evenings, he made a cash donation anonymously. Thus, he is your base. If Mr. juntunen were holding phenomena up to standards, he certainly didn’t concern himself or the reader with any actual evidence. There were quite a few AIM artists there whose biographies also include award winning theatrical performances and writing accomplishments. Arts in Motion makes it their mission to hold the biographies and stories of their students up in equal importance to those of he other chair artists, and the performances and examples of their work that night could have served, in the article of evidence of that. The names and resumes of the artists represented at Chair Affair are not the bottom line- neither is Mr. Juntunen’s no-longer-anonymous-but-none-the-less-appreciTed donations. Our base is our students and their families. The Chair Affair audience is our fan club. We’re sorry that point was missed.